Polyethylene (poly) water tanks are made of a plastic material. Many have seen the effects on plastic objects that are exposed to the harmful UV-rays of our Sun. Over time, they become brittle, chalk and crack as the polymer elongation drops, that is, the structural integrity of plastic. The natural conclusion, and we know our steel tank competitors often repeat this untruth, is that poly tanks won’t last long in the Sun. This is just not true, especially not with Team Poly’s tanks which are made from Rotathene® SUPA UV poly material, our coloured poly tanks have more than 4.5 times the UV8 protection required by the Australian standard for poly water tanks (AS/NZ 4766:2006). Many metals will rust and corrode as they weather and wither away. Steel however, can be strengthening against oxidisation when chromium is added. There are different grades of stainless steel. Kitchen sinks, for example, are often made of a high-grade of stainless steel. Similarly, UV stabilisers are to poly tanks like what the chromium is to steel. When added to the polymer mix, the plastic is protection against becoming brittle in the Sun. The use of stabiliser resin can inhibit or absorb the harmful UV light that causes polymer to break down. So in the same way that some steels are called stainless, you could similarly label UV stabilised poly a type of “stainless poly”. Of course, all material has a finite life. Stainless steel will still rust and corrode, it just takes a much longer time for such to happen or very extreme conditions. Australia experiences some of the highest levels of UV radiation in the world. As such, leading edge technology in polyethylene is required to ensure poly water tanks remain reliable and durable for a long time. Traditionally a UV8 level of stabilisation has been considered the minimum required for good long term protection in Australia. Rotathene® SUPA UV, used in Team Poly’s tanks, provides a much higher level of protection than the Australian industry standard (AS/NZ 4766:2006). Through careful selection of a high quality Polyethylene base polymer specifically designed for tank use, advanced additives such as UV stabilisers and antioxidants, pigmented “SUPA UV” provides a UV36 level of stabilisation. UV protection levels in polyethylene are assessed under highly controlled conditions of high intensity UV radiation with similar wavelengths to those from the Sun. The test temperature is also controlled since temperature can affect additive consumption and polymer degradation. A number of sets of identical “natural” (un-pigmented) poly samples are prepared and all but one set is placed in a weatherometer test chamber and irradiated with UV over thousands of hours. Samples are removed from the UV weatherometer every few thousand hours and stretched in a tensile tester to determine how much they can still stretch. This provides the % Elongation of the test sample. This value is compared to the value obtained for the set that was not placed in the weatherometer and recorded on a graph as the % Retained Elongation. As poly degrades, its ability to stretch declines and it will eventually become brittle. The % Retained Elongation decreases as degradation increases. Once the Elongation drops to 50% the poly sample is deemed to have failed. A poly grade that takes 8,000 hours of intense UV radiation to drop to 50% of the value for its original unexposed samples, is said to have a UV8 level of protection. Rotathene® SUPA UV takes longer in the UV weatherometer before it drops to 50% of the elongation value. 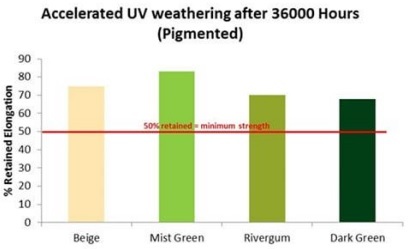 Even after 36,000 hours of accelerated UV weathering, pigmented SUPA UV poly samples retained well over 50% of their original elongation properties. In conclusion, you can be assured that Team Poly’s water tanks are designed and built to last out in the Sun and backed by a long 25 year warranty. The use of “SUPA UV” polyethylene material is cutting edge technology and only used by a handful of rotomoulding manufacturers in Australia.